Having some issues transferring copies of our data so it's going to be a bit longer again as they need to do something different to get the data off of it. We were previously expecting the rebuild to be taking place about now, will now likely be later this afternoon or tomorrow morning. Good news is though, servers will likely be restored without us having to do anything initially - just need to setup all our backup software and scripts and stuff afterwards. So chances are you'll probably realise they're up when we do. Backup taken and transferred off. Fresh installation currently in progress. Perhaps later this evening, otherwise will likely be tomorrow. We have our server back now. TS3 has been up a while and I'll leave it up overnight. However, expect disruption over the next 24 hours. Yellow will be working on getting our CSS stuff back up through the course of tomorrow. Thank you everyone for your efforts, especially people who have had their weekends disrupted getting this all back up for us! 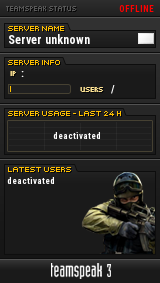 CSS servers are all up now besides gungame which should be up in an hour or so. See you all on tomorrow! got a question though... in gungame on gg_factory, has the bots always been able to see through the floor? That's good news getting every thing up much sooner then expected. Thanks to everyone involved. Lady BunBun wrote: got a question though... in gungame on gg_factory, has the bots always been able to see through the floor? Bots will see through most things; walls, boxes, smoke, floors and doors etc. adds to the challenge though!